Londons first new bridge for some time. 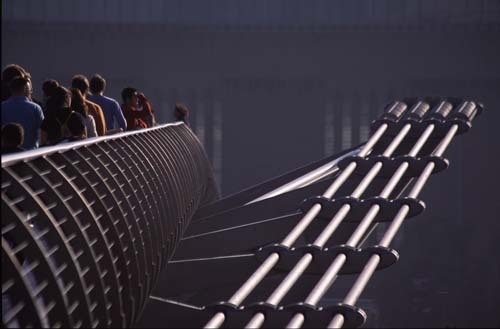 When first constructed was given the nickname of " The Wobbly bridge" due to the amount of sway when being used.Designed by Sir Norman Foster it had to be shut after 2 days.A passive dampening system was put in place , this solved the problem. It now is a major attraction as well as a vital link to the two banks of the Thames,which have seen considerable improvements recently.